Don't forget the Bib Gourmand list too! With the Michelin Recommended list buried into the guide itself, it would be awesome to get some restaurants on the Bib Gourmand list. Thanks for this, Josh! Will be trying out a couple of these places ! What is their criteria for "Michelin Recommended"? 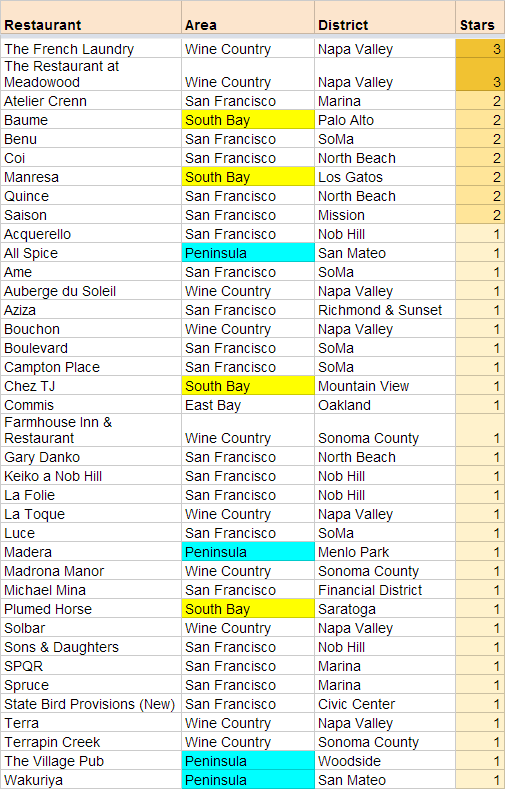 I've been to about half of the ones listed in San Jose, and the results are so hit or miss that I can't really say that whoever categorizes them as "recommended" knows what he/she's doing. Vung Tau - edible (though not great, or even good) Vietnamese food. Just about every other Vietnamese restaurant in San Jose is going to be better and cheaper. Excellent ambiance and service though. La Costa - Great food, especially the ceviche, and everything is way cheap -- although there are better Mexican restaurants/taco shops in San Jose, this one is up there. However as far as ambiance goes it's a complete pit. Don't get me wrong -- I'll take food over ambiance any day, but comparing this one to Vung Tau makes the Michelin recommended list lack consistency. Backayard: Meh, it's ok. The meat is seasoned well but has a strange texture. The side dishes are just ok. This is the only (or one of the only) Caribbean restaurants in San Jose so I'll give it props for that, but what it has going for it is that it's unique, not necessarily better. SJ Omogari: Another one that's "just ok," this Korean specializes in nothing, doesn't have that big extensive of a menu, and what it does have it does decently but not stellar. Side dish selection is staid. Almost all the Korean restaurants on/off El Camino in Santa Clara are much better. Haven't been to the others, but Bun Bo Hue An Nam is on my list. Oh wow, you're the first person I have heard call Back-a-yard okay. I can't think of any better Jamaican food in the Bay Area. Their jerk chicken + corn fritters are amazing. I really like Vung Tau and Thien Long as well, have not been to La Costa yet and in fact had no idea it existed until I read the guide. I will give the corn fritters a try. The sides I had were the rice and beans (which tasted like they were instant and/or from a can) and the slaw (generic). What other Jamaican or Caribbean restaurants have you tried in the Bay Area? They seem to be few and far between. I forget the name, but there's one in Berkeley near the corner of San Pablo and University, maybe two doors down from a coffeeshop called Local 123. Well, not many I'll give you that =). Coconuts in Palo Alto and the original Back-a-yard in Menlo Park are a couple for comparison. I did have someone who lived in Jamaica for years try out Back-a-yard Downtown and it became one of his favorite restaurants. You might have been there on a bad day, I would give it another shot. My wife hates spicy food and even she couldn't get enough of the jerk chicken. Oh, and there's that place inside Jack's Bar in Japantown on Fri/Sat (?) nights. Fitzroy's Caribbean or something like that. Haven't been. Spicy Roy's inside Jack's appears to be closed. Too bad, it looked good & I live nearby. I've been to Back-A-Yard too and wasn't at all impressed. It actually seemed cruddy to me. Bung Tau is trying to be fancy or something. Service was totally awkward, prices high and food pretty boring. Sigh. Hachi Ju Hachi in Saratoga is in this year's bib gourmand list (2 entrees and a dessert/wine for less than $40). I believe Kabab n Curry's in Santa Clara used to be on that list too. They are, but I only listed places in San Jose proper.